Progmatic is back on Saturday 1st November 2014. 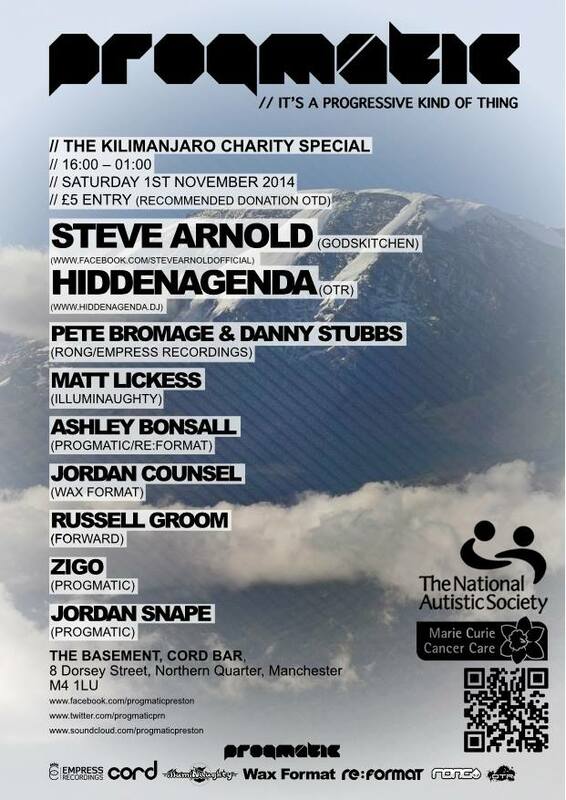 Progmatic will be taking over the basement at Cord Bar, Northern Quarter, Manchester for a day/evening of progressive vibes. Resident Jordan Snape is climbing the mighty 19,300ft Mount Kilimanjaro with his uncle in aim of raising money for Marie Curie Cancer Care & The National Autistic Society – two fantastic causes. This event is dedicated to raising money for these two gents and their respective charities. What better way to bring everyone together than through the music that we love so much at Progmatic? !